Working with graphene is not for the faint of heart. While many tech entrepreneurs are attracted to the promise of graphene – a nanomaterial that is both strong and transparent and that provides conductivity that is far superior to silicon, copper and more commonly used materials — it is also a great unknown. Documentation on working with graphene is scarce. Graphene is a delicate material that requires honoring rigorous quality standards, and process development can be time- and resource-intensive. Increasingly, however, there are designs for which graphene is ideal, making it well worth the investment in time and resources. That was the case for our partner, biotech pioneer Nanomedical Diagnostics. I shared the inside story of Rogue Valley Microdevices’ manufacturing partnership with Nanomedical Diagnostics, which resulted in the manufacture of the first commercially available graphene biosensor, in Medical Design Technology. 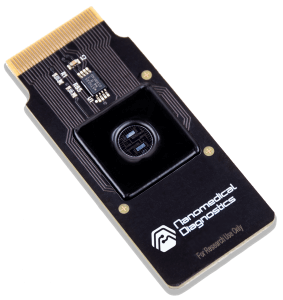 Nanomedical Diagnostics’ biosensor allows pharmaceutical and biotherapeutics companies to characterize biomolecules quickly and easily, potentially transforming the field of drug discovery.